It has long been recognised that services can only improve when they are informed and shaped by people who use those services, their families and carers, and local communities. In this period of unprecedented change – where the integration of health and social care is transforming services with the aim of achieving better outcomes for people – this need for proper and meaningful engagement between those who provide services and those who access them has never been more important. 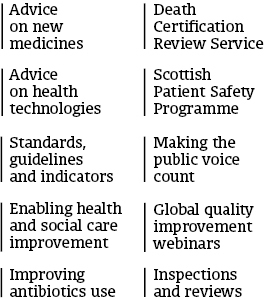 Since 2005, the Scottish Health Council has worked in many different ways with NHS boards across Scotland to help them improve how they engage with patients and communities. This role has evolved over time, and in recent years the Scottish Health Council has increasingly been working across both health and social care, gathering people’s views directly to inform service and policy development, and playing a key role in shaping and implementing the Our Voice framework (where the public are enabled to engage with health and social care providers to improve services). Taking all of this into account, we decided it was an appropriate time to review the role of the Scottish Health Council, which is a key part of Healthcare Improvement Scotland. We want to ensure that the Scottish Health Council can best support the transformation that needs to happen in health and social care, and help ensure that people’s voices are heard and acted upon in service design and delivery. This aim is consistent with Healthcare Improvement Scotland’s new strategy, Making care better – Better quality health and social care for everyone in Scotland, which puts people at the heart of everything we do. And this is why we are leading on the consultation, Strengthening people’s voices in health and social care. The consultation focuses on seven areas which relate to the current role of the Scottish Health Council and how this might change in order to ensure that people have a strong voice in health and social care. Should the Scottish Health Council support the involvement of people in social care services, as well as in health services? If yes, how should it do this? Should the Scottish Health Council lead in finding evidence of the best ways to support people and communities to get involved and give their views? If yes, how should it do this? Should the Scottish Health Council offer advice to Health and Social Care Partnerships on how to involve people and communities when changes are being made to health and social care services? If yes, how should it do this? Our consultation closes on Friday 20 October so there is still time to give us your views about the future direction of the Scottish Health Council. For those who don’t have internet or email access, paper copies of the consultation report and the online questionnaire are available on request. Details of how to register for these events can be found, along with other information about the consultation on our website. We will collate and consider all responses to this consultation which will directly inform the future of the Scottish Health Council in co-ordination with our stakeholders. I would encourage anyone with an interest in ensuring that people have a strong voice in health and social care to get involved in this consultation and feed in their views.